How can I send a test notification to my web browser? 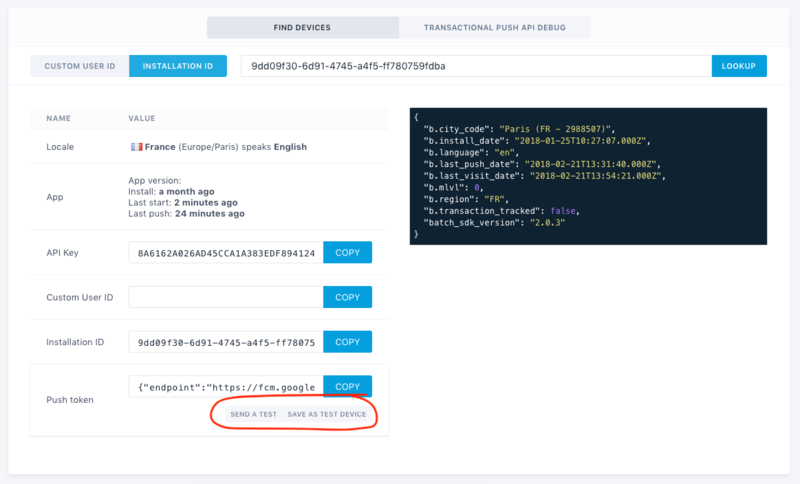 You can send a web push to your browser from the dashboard to ensure your notification is displayed correctly and test your integration. Batch allows you to find information on your installation and save your push token to send test notifications to your web browser. This is useful to test your integration or make sure the notification you are editing looks as expected on desktop or mobile. Open your website, right-click somewhere on the page and select "Inspect" or "Inspect Element" in the context-menu that appears. On Batch's dashboard, go to Settings > Debug, paste your Installation ID to find your device token. Then click "Save as a test device" below the "Push token" field. Note: Web push notifications do not work in incognito mode. You can send test notifications to your a saved device or to a push token you already know from the message editor. Just click the ⚙️ to select your device and "Send a test".